Ever since our Design Team cards started coming in using our JustRite stamp sets I have been dying to try them out myself so today I stole a few minutes after the store closed and made this card. It really started with a sample I had made of the Floral Doily earlier in the day for a customer who came in. I had spritzed it with a Shimmer Spritz (Frost) to demo that product as well. When I saw that lying on my work table in my favorite purple and the perfect round shape, I knew I was on the way. After that things just sort of came together. 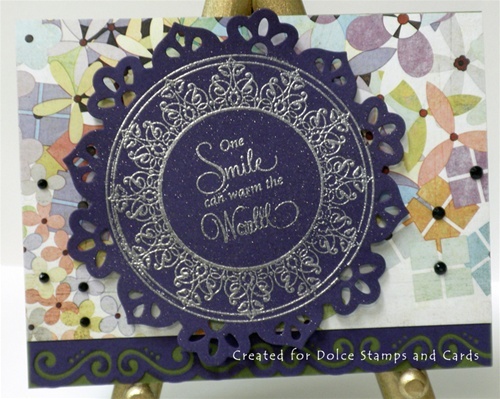 After embossing my JustRite sentiment on my doily, I offset it a bit and popped it up to make stand out. I added a few black rhinestones to some of the DP flower centers to add a bit more accent. I was so tickled to find that even I could make a card with these great stamps!